I must start this one by pointing out that I have, as far as I know, never heard this band before in any form prior to that I was able to set aside time for listening to the new creation Madness for the first time sometime in early March. 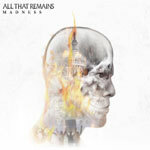 For some reason, probably something bias related, I was dead sure that All That Remains was some kind of a mediocre metalcore unit with all sorts of trendy elements involved, such as a semi-crappy vocal performance with a lot of screaming in the verses and clean singing in the choruses. I was wrong, because Madness is a diverse record in general and the band puts many different things to the music and to put a label in there it ends up somewhere between alternative stuff and today's new style of heavy metal. The band comes out with modern shaped metal riffs and solos, and in the heavier songs a slightly machine-like type of sound, as well as a for the most part clean vocal style, even though aggressive singing isn't completely distant over the record. The songs are in the range from pretty gentle ballads to rather fast and industrial stuff, but those two extremes are oftentimes also what I like the least about this album, since I think that the mid-tempo songs with a melodic flow and convenient and highly captivating choruses where they create a great atmosphere are what interest me the most. Perhaps a little too much focus is targeted at the chorus of each song, but on the other hand that's probably what people remember after listening to the record and of course it makes the songs come out even more attractive in the end. As I'm about to finish this text I still haven't heard anything from this band besides this record and maybe it's best to keep it that way because what if my bias turns out to be correct eventually? Time will tell what my final decision is, but until then I will certainly listen to Madness every now and then, simply because it comprises a bunch of songs that appeal to me more than just for the moment.